Download "Savings Accounts. General Terms and Conditions"
4 to switch the account or close it without having to lose any interest or pay any additional charges If you do not notify us that you object to a change before the date on which it comes into effect, you will be deemed to have accepted it The information on our website will be updated within three working days of an interest rate change. 7. Account charges 7.1. We may make charges for items relating to your account. 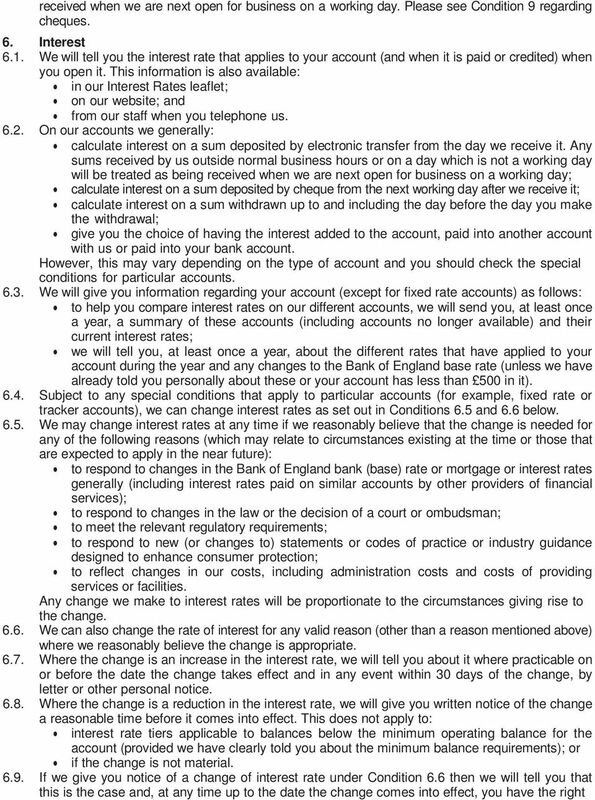 Details of any charges relating to the day-to-day running of your account are contained in our Interest Rates leaflet. You can also find these on our website or by telephoning us Where the charge does not relate to the day-to-day running of your account we will tell you before we provide the product or service, or at any other time you ask Charges incurred will be debited to your account. We will notify you before we do this We can change the charges we make at any time if we reasonably believe that the change is needed for any of the following reasons (which may relate to circumstances existing at the time or those that are expected to apply in the near future): to reflect changes to our costs, including our administrative costs; to respond to changes in the law or the decisions of a court or ombudsman; to meet relevant regulatory requirements; to respond to new (or changes to) statements or codes of practice or industry guidance designed to enhance consumer protection; Any change we make to our charges will be proportionate to the circumstances giving rise to the change We can also change the charges we make for any valid reason (other than a reason mentioned above) where we reasonably believe the change is appropriate Changes may include the abolition or alteration of existing charges or the introduction of new charges If we change a charge relating to the day-to-day running of your account under Condition 7.4 or 7.5, we will give you at least two months written notice before the charge comes into effect If we give you notice of a change in the charges we make under Condition 7.5 then we will tell you that this is the case and, at any time up to the date the change comes into effect, you have the right to switch the account or close it without losing any interest or paying any additional charges If you do not notify us that you object to a change before the date on which it comes into effect, you will be deemed to have accepted it There may be other taxes or costs that are not paid through us or charged by us. 8. Withdrawals 8.1. Withdrawals may be made during our normal business hours on working days subject to the special conditions for particular accounts. We will process your withdrawal instruction on the same working day that we receive it unless you request that it is processed on a future date or we receive it after 3.00 pm on a working day. Requests received after 3.00 pm will be processed on the next following working day Withdrawals made using the Society s online MyAccounts service that are received before 2pm on a working day will be processed on the same day. Requests received after that time, or not on a working day, will be deemed to have been received on the following working day No withdrawal would be allowed if it would cause the account to be overdrawn. You may cancel a withdrawal instruction by contacting us provided your instruction has not already been processed We may refuse to allow a withdrawal if we are not satisfied that we have the proper written authority for the withdrawal in accordance with the mandate you have given us. A fully completed and signed withdrawal form will be required in order to make a withdrawal We can restrict the amount which can be withdrawn from any account. We will only do this if: we reasonably believe that there may be fraudulent activity or other financial crime affecting the account; we are required to do so by any law, regulation or court order; there is a dispute (which we reasonably believe may be genuine) about the ownership of, or entitlement to, the money in the account. 5 8.6. Where a withdrawal made by electronic transfer does not reach your other account we will investigate this. Where the payment has not been received by your other bank or building society within three working days, and provided that we were given the correct account information for the payment, then we will refund the amount of the payment to your account with us together with an amount to cover any associated charges and lost interest. 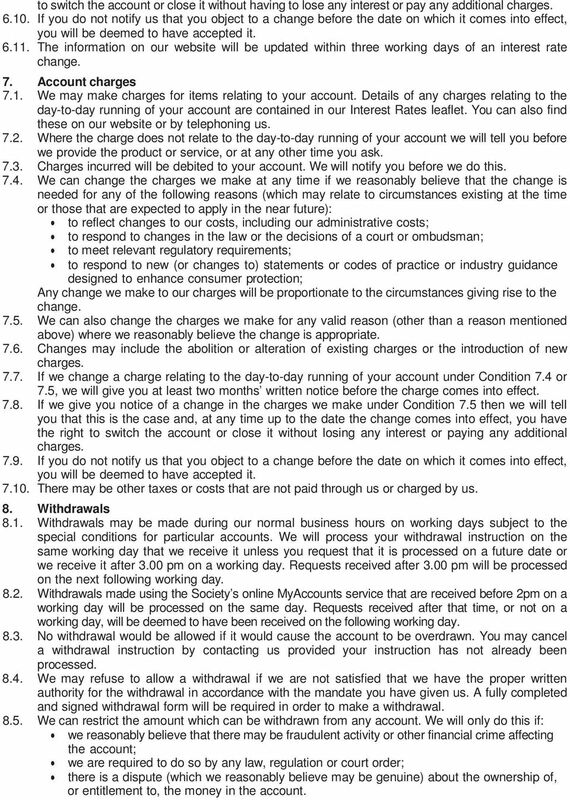 Where the payment has been received by your other bank or building society then it is their responsibility to correct any error Please also note that: we do not permit withdrawals to be made by direct debit or standing order; withdrawals made by the Faster Payments Service may take up to three working days to reach your other account. 9. Uncleared funds 9.1. Subject to any special conditions for particular accounts, and to Condition 8, we will allow withdrawals against a cheque six working days after it has been deposited with us, provided we have not received notice that it has not been cleared. If the cheque is not cleared then you will have to repay us the amount of the withdrawal to the extent that there is not enough other money in the account to cover it. However, we will not take money from your account, or require you to repay us, in respect of a cheque that has not cleared unless: you agree otherwise; you are knowingly a party to a fraud in respect of the cheque; or the money is reclaimed from your account before close of business (5.00 pm) on the sixth day after it was deposited with us If a cheque that is deposited by you is not cleared, we will tell you about this by writing to you For the purpose of Condition 9.1, the day of deposit of the cheque is the day it is presented at the Society s head office or the day we receive the cheque by post, except that in each case if the time of payment in or receipt by post (as the case may be) is not before 3.00 pm on a working day, then the day of deposit is the next following working day. 10. Closing your account You can close your account at any time, subject to any special conditions that apply to particular accounts and to normal administration requirements We can close your account at any time without giving any reason, but (except in exceptional circumstances): we will give you at least two months written notice, or such period of notice you would have to give us in order to close your account (or to close it without having to pay a charge or losing interest), whichever is the longer; we will not use this right to repay a fixed term investment before the end of the fixed term; and we will not close your account, or threaten to do so, as a response to a valid complaint that you have made. 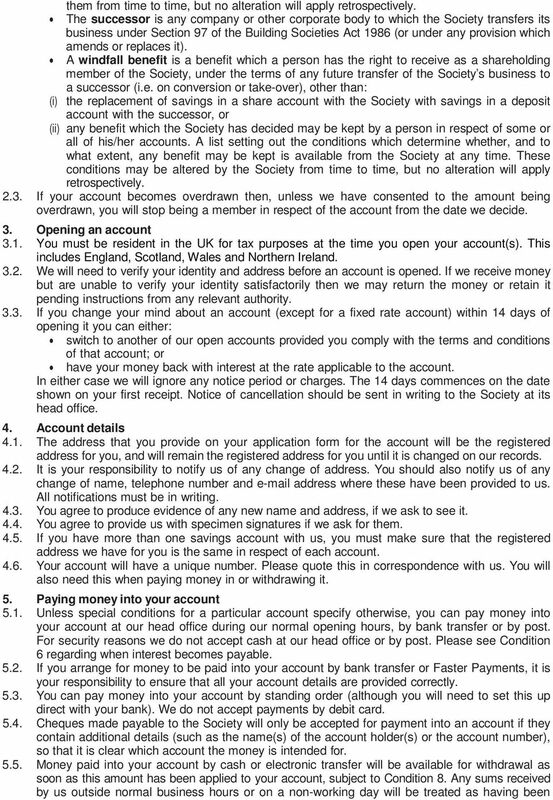 The exceptional circumstances mentioned above are: you have deliberately given us any false information in relation to your account; you were not entitled to open the account; you do not comply with any of your obligations under the terms and conditions, and do not put this right within a reasonable time of our asking you to do so; the contract between us is void or unenforceable at law; or we have a legal obligation to close the account If we close the account, we will pay interest at the agreed rate up to and including the date of repayment. We may make repayment by sending you a cheque If we close the account in full and make repayment to you, in person or by post, then you will have no further right or interest in the account. 11. Statements We will send you a statement of account annually, unless: we have reasonable grounds to believe that you are not resident at your last known address and we are unable to contact you in any other way to get details of your new address; or you have elected not to receive them. Condition 14.2 applies because you have transferred the balance to another within our product range. In that case you will receive a statement in accordance with the specific terms and conditions of that product. 6 11.2. You should check all statements carefully. If there is an entry which seems to be wrong, you should tell us as soon as possible. If you do not tell us within 13 months after the date of the entry, we will not be obliged to correct the error If you request it we will send you information in relation to transactions on your account monthly unless there have been no transactions on your account (other than the crediting of interest) during the previous month. 12. Taxes Where required by legislation, interest will be paid or credited after deduction of income tax at the appropriate rate. Tax treatment depends on your individual circumstances and may be subject to change in the future. Please contact the Society for further details. 13. Joint accounts and trusts If an account is held in more than one person s name, then only the holder whose name appears first in our records will be entitled to membership rights (such as the right to receive notices of, and to attend and vote at, meetings). This is subject to any rights given to other holders by any legislation You can choose the order in which the names appear in our records. Any change in the order will happen when our records are actually changed. We will make the change within a reasonable time after you tell us about it For tax purposes only, we will treat joint account holders as being entitled to the money in the account in equal shares. This does not affect the operation of Condition 13.4, which takes precedence Where one account holder dies, we will, on receipt of satisfactory evidence of the death, treat the surviving holder(s) as being entitled to the account. We do not accept accounts on any other basis. The other terms of the account will remain unchanged. (Under the Rules, joint accounts cannot be held by the holders as tenants in common.) Withdrawals and other transactions on a joint account need the signatures of all account holders, unless all of them have authorised us to accept the signature of any one of them or (if there are more than two holders) any combination of them. 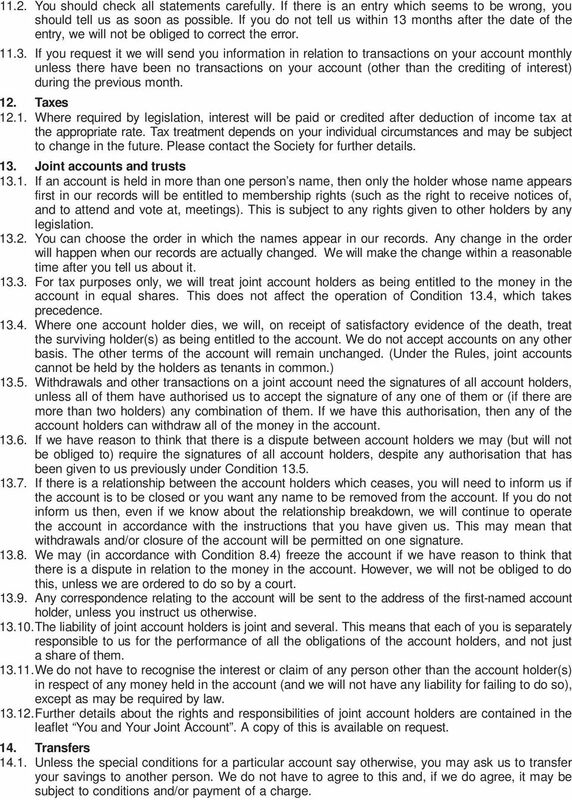 If we have this authorisation, then any of the account holders can withdraw all of the money in the account If we have reason to think that there is a dispute between account holders we may (but will not be obliged to) require the signatures of all account holders, despite any authorisation that has been given to us previously under Condition If there is a relationship between the account holders which ceases, you will need to inform us if the account is to be closed or you want any name to be removed from the account. If you do not inform us then, even if we know about the relationship breakdown, we will continue to operate the account in accordance with the instructions that you have given us. 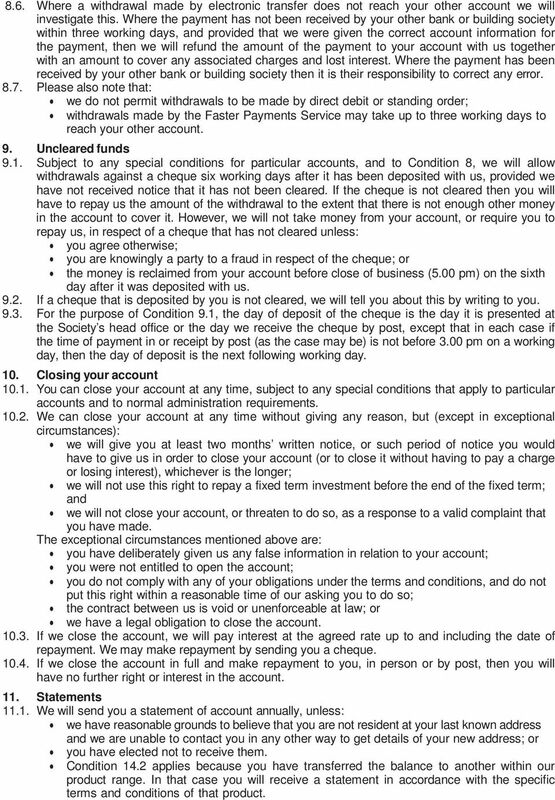 This may mean that withdrawals and/or closure of the account will be permitted on one signature We may (in accordance with Condition 8.4) freeze the account if we have reason to think that there is a dispute in relation to the money in the account. However, we will not be obliged to do this, unless we are ordered to do so by a court Any correspondence relating to the account will be sent to the address of the first-named account holder, unless you instruct us otherwise The liability of joint account holders is joint and several. This means that each of you is separately responsible to us for the performance of all the obligations of the account holders, and not just a share of them We do not have to recognise the interest or claim of any person other than the account holder(s) in respect of any money held in the account (and we will not have any liability for failing to do so), except as may be required by law Further details about the rights and responsibilities of joint account holders are contained in the leaflet You and Your Joint Account. A copy of this is available on request. 14. Transfers Unless the special conditions for a particular account say otherwise, you may ask us to transfer your savings to another person. We do not have to agree to this and, if we do agree, it may be subject to conditions and/or payment of a charge. 7 14.2 You may transfer the balance of your account, in whole or part to another in our range, subject to fulfilling the conditions of your existing account with regards to any notice or penalty due, and meeting the conditions of the new account. Interest is not credited to your account on transfer (unless we notify you otherwise). Interest will next be credited as specified in the terms and conditions of the new product. 15. Unclaimed balances We may close your account if: you cannot be traced after reasonable enquiry; and for a period of five years (or three years if the amount in your account is less than 100), no money is paid into, or withdrawn from, your account. If you contact us at a later date and provide us with satisfactory proof of your identity, we will reopen the account and credit it with the amount we owe you in respect of the account (which will be equal to the balance that was in the account when we closed it, together with interest at a rate which we reasonably consider to be appropriate and adjusted for any fees or charges we would have deducted if the account had remained open) Condition 15.1 is subject to any rules that may be made under any legislation. 16. Account documents We may issue you with a passbook, certificate or other similar document relating to your account. If we do: the document will belong to us; you agree to return it to us for updating, or for any other purpose we reasonably require; you agree to keep it safe, and to tell us in person at our head office or by telephoning us on as soon as you discover it has been lost or stolen; and the document must be produced to us before any withdrawal from the account is made We may issue a replacement for lost or stolen documents but this may be subject to payment of a charge and/or other conditions. 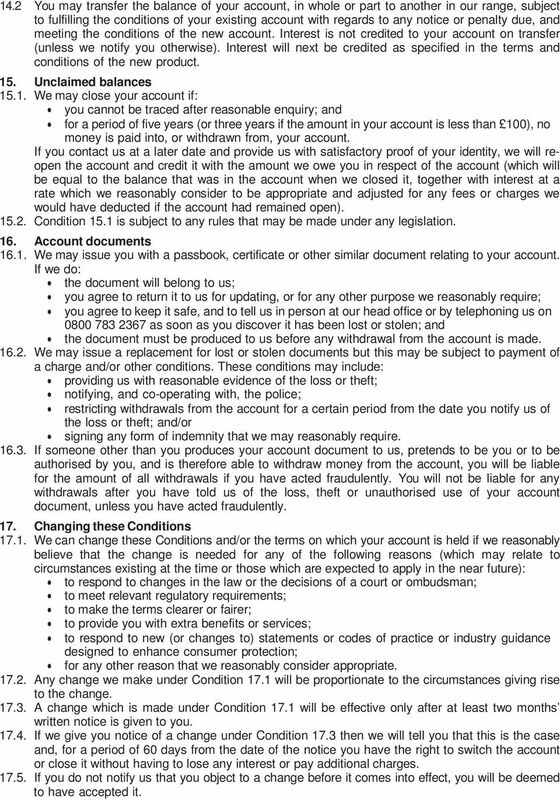 These conditions may include: providing us with reasonable evidence of the loss or theft; notifying, and co-operating with, the police; restricting withdrawals from the account for a certain period from the date you notify us of the loss or theft; and/or signing any form of indemnity that we may reasonably require If someone other than you produces your account document to us, pretends to be you or to be authorised by you, and is therefore able to withdraw money from the account, you will be liable for the amount of all withdrawals if you have acted fraudulently. You will not be liable for any withdrawals after you have told us of the loss, theft or unauthorised use of your account document, unless you have acted fraudulently. 17. Changing these Conditions We can change these Conditions and/or the terms on which your account is held if we reasonably believe that the change is needed for any of the following reasons (which may relate to circumstances existing at the time or those which are expected to apply in the near future): to respond to changes in the law or the decisions of a court or ombudsman; to meet relevant regulatory requirements; to make the terms clearer or fairer; to provide you with extra benefits or services; to respond to new (or changes to) statements or codes of practice or industry guidance designed to enhance consumer protection; for any other reason that we reasonably consider appropriate Any change we make under Condition 17.1 will be proportionate to the circumstances giving rise to the change A change which is made under Condition 17.1 will be effective only after at least two months written notice is given to you If we give you notice of a change under Condition 17.3 then we will tell you that this is the case and, for a period of 60 days from the date of the notice you have the right to switch the account or close it without having to lose any interest or pay additional charges If you do not notify us that you object to a change before it comes into effect, you will be deemed to have accepted it. 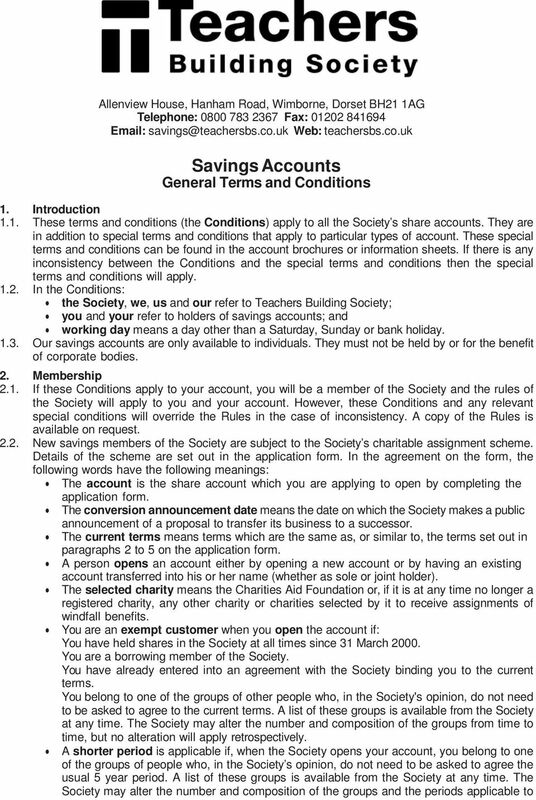 Savings General Savings Account Terms & Conditions Effective 1 st June 2015. 1. 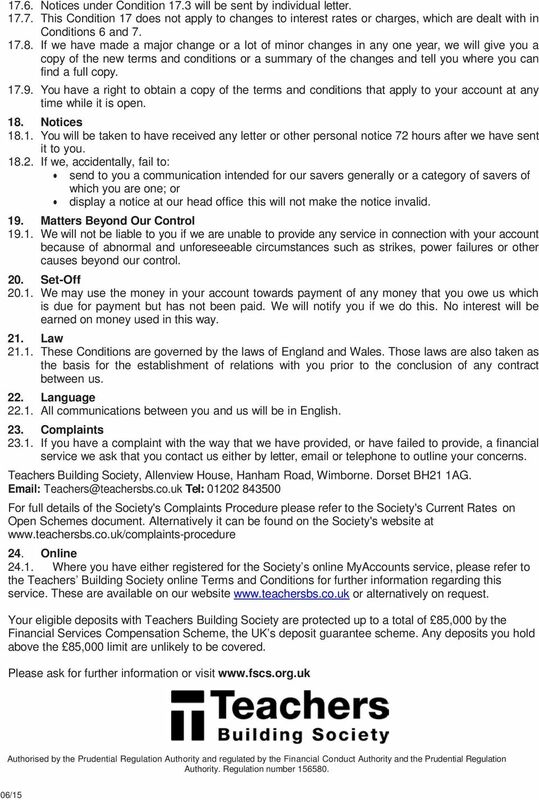 Introduction This document sets out the general terms and conditions that apply to the accounts that you hold with the Society. Content General Terms & Conditions. Additional conditions which relate to Cash ISA products. Protecting your interests. Please read carefully. EBS Children's Savings Account Specific Terms Introduction The EBS Children s Savings Account is designed to enable young people to save whilst also allowing instant access to the savings at EBS offices. General Investment Conditions Ireland. The important information you need to know about opening and maintaining your account.